Hi culture-loving bees! I’m Mardie, and I’ll be writing about theatre happenings in the area—everything from the biggest Broadway blockbusters to low-budget downtown performance art. I hope to share some reviews and suggestions with you, as well as offer insight into special events, local talent, and other goings-on about town. I’m not an actor (well, not since college)—but I’m a fully admitted musical theatre geek and will happily provide you with more details than you could ever possibly want or need. Hooray! Theatre in New York is a funny thing. It’s presumably an art form for the masses, and yet the going rate for a standard Broadway ticket is $120, not including service fees. So… after two tickets, dinner, and that “Hakuna Matata” baby tee that your girlfriend insists on, a night of Broadway can easily cost half a paycheck. After the jump, I have a few suggestions for those who want to enjoy the excitement of the Great White Way on a budget! The first option is TKTS. 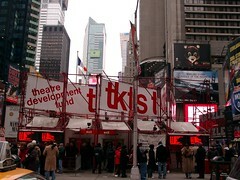 Run by the Theatre Development Fund (a not-for-profit in support of letting the non-rich see shows), TKTS booths offer same-day tickets for Broadway and Off-Broadway shows at a 25%, 35%, or 50% discount. It’s a great option if you know you want to see a show that night but don’t have something specific in mind—you’re basically guaranteed tickets to something. While the perpetually sold-out blockbusters probably won’t be offered, there’s almost always a worthwhile show available. Just remember to bring cash – TKTS booths don’t accept credit cards. For rules, hours, locations, and a list of the previous week’s offerings, click here. While TKTS is a great guarantee, sometimes $65 is still too much to pay, no? If you’re feeling lucky, the best way to see a big-name show for very little money is by entering one of the numerous ticket lotteries. The “lottery rush” system all started back in 1996, when the starving hipster rock musical Rent moved from its modest origins in the East Village to the shiny, expensive Nederlander Theatre in the heart of Times Square. The producers were concerned that the move (and subsequent exponential jump in ticket prices) would alienate the very audience that their show so poignantly depicted, so they created a system in which theatergoers of “lesser means” could camp out in front of the theatre for a shot at $20 front row seats. The system worked so well that several shows now offer the option—though thankfully the tickets are now distributed through a random drawing before the show, thus eliminating the need to sleep out on the sidewalk! Each show has its own rules, prices, and seat availability—please click here for a complete listing of individual policies. The list also includes options for cheap standing-room-only tickets (if you’re feeling particularly sturdy that day) as well as inexpensive alternatives for students with proper ID. So never fear, brave theatergoers! Whether you opt for a TKTS discount, a lottery rush, or subscribe to one of the various internet discount clubs (which I’ll write about another time) there are many options for expanding your cultural horizons that don’t require selling your grandmother’s prized brooch to buy a ticket. Next week I’ll offer some personal recommendations of currently playing shows to suit every taste. (Please feel free to email me at [email protected] if you’d like to know about a particular show.) Until then… get out there and enjoy some quality entertainment for cheap!